The client, a bachelor, found that his existing house, located on a bluff overlooking Amagansett Beach, did not provide enough space for entertaining his many friends and family for the summer. The existing pool deck provides stunning panoramic views of the ocean, so capitalizing on the view and creating an easy flow from inside to outside was critical in the design of this 5,000 square-foot modular guest house addition. The client’s brief called for the existing house to remain, so a large auto court was created to accommodate guest entry. Additionally, a new sitebuilt garage is cantilevered off the bluff. A large hydraulically-operated glass garage door and floor-to-ceiling glazing opposite the garage door maintain views to the water from the court. Cedar trellises direct guests from the gravel auto court to the guest house entry while screen walls offer privacy at the entry to the existing house. The entry to the guest house bridges existing and new, allowing the client to close-off the main house from guests when privacy is desired. Large pocketing glass entry doors preserve the view from the auto court across the length of the property. 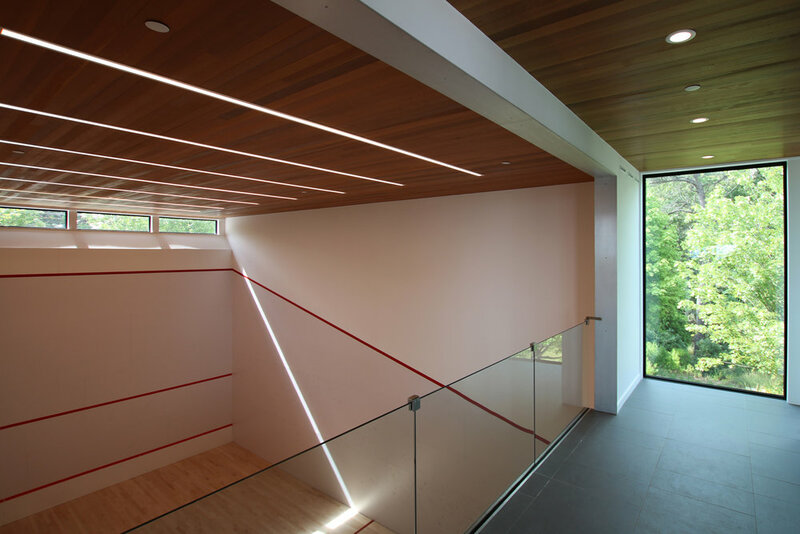 To the left of the entry, the addition includes a site-built squash court, and glass-lined corridors lead to an expansive living space, which can accommodate large groups for poolside parties. Folding glass doors along the entire south side open this façade up to the decks outside, while maintaining clear ocean views throughout the space. 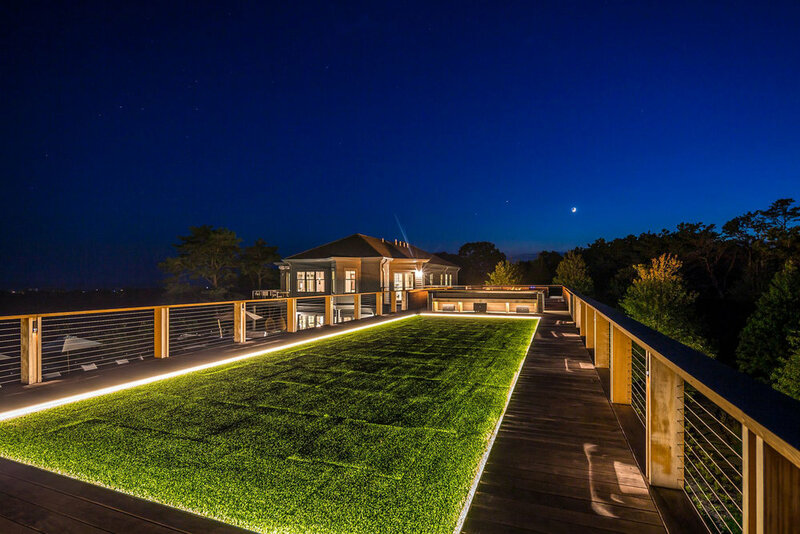 From the pool deck, two exterior stairs bring guests up to a roof deck that covers the entire addition and includes a turf-covered bocce court, oversized fire pit, and a large custom stainless steel hot tub. From atop the roof deck, guests enjoy even more sprawling ocean views. On the lower level, a home gym and five guest bedroom suites look onto the garden, and large sliding glass doors to each room provide easy private access. 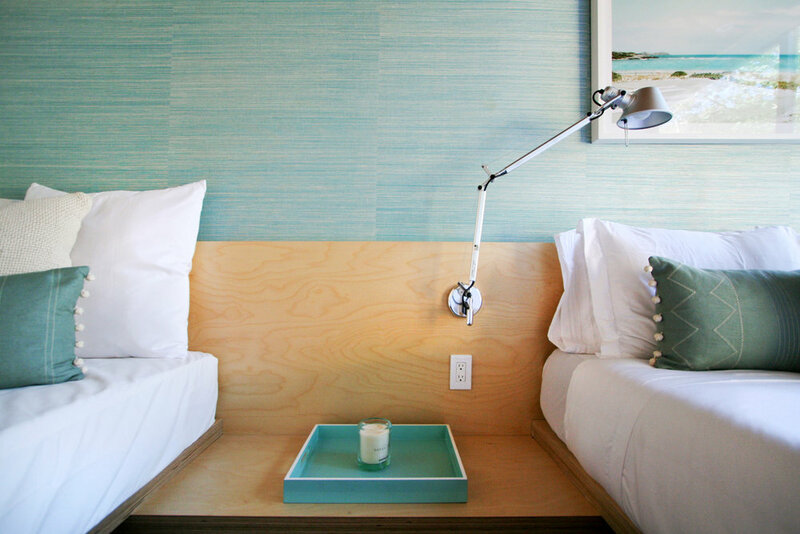 Each bedroom suite has built-in Baltic birch beds and an ensuite bathroom. A bridge across the garden landscape was also added, leading to a secluded perch in the wooded hilltop. This intimate deck incorporates another fire pit and hammock for stargazing.